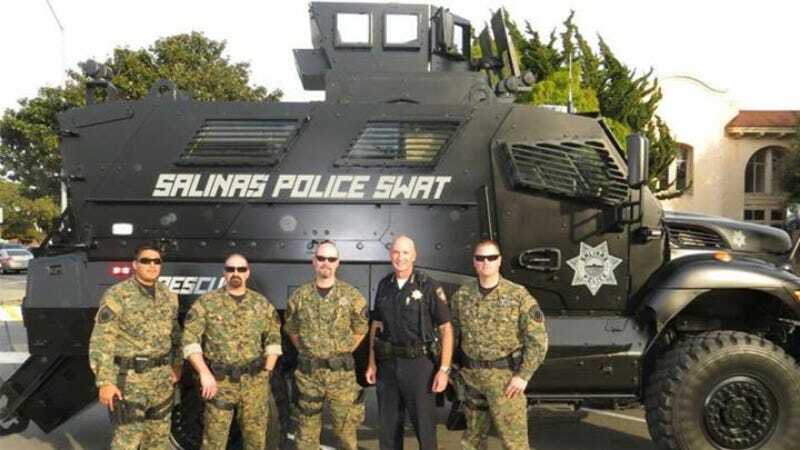 On December 17th the police department in Salinas, California unveiled a new "Armored Rescue Vehicle" that'll shield officers from bullets and grenades but cannot, they're learning, shield them from the barrage of negative comments from the public. Lifesaving? BS. Trigger happy pigs now have a new toy to kill. If the pigs have a tank, civilians should have anti-tank weaponry to have a fighting chance. The police are NOT your friends. They no longer serve and protect' they enforce. This sure do look a lot like USSR AND China lately don't it? Why are cops in CAMO? What the F is going on in this country? These amped-up "paramilitary civilian police" escalate these situations because they get away with it... Strip away there millions of dollars of military gear and armor and send them in dressed in their street clothes like the civilians they are assaulting and murdering and watch how quickly they De-escalate the situation. Given the imposing appearance of the vehicle, a Navistar Defense MaxxPro, the "police state" complaints should have been pretty predictable— it's a 37,500-lb war machine designed to withstand combat gunfire and explosive impacts. Also featured is an 18,000 pound winch and seating for ten. The LENCO Bearcat, a vehicle that's traditionally used in police SWAT applications and looks a bit less intimidating, was deemed too expensive at $250,000-$300,000. Of course the Navistar is worth more than $600,000, but thanks to the federal "1033 Program" that re-assigns military equipment to domestic law enforcement agencies in need, Salinas PD was able to get the vehicle for the cost of shipping and repainting it. Even that was subsidized by a Homeland Security grant, leaving the acquisition bill at $4,150. The department's outgoing SWAT truck was a 1986 Ford "money carrier," which Chief Kelly McMillin claimed was literally sealed with duct tape. It was dispatched 15 times in 2013. City-Data.com calls the crime rate in Salinas "Average."